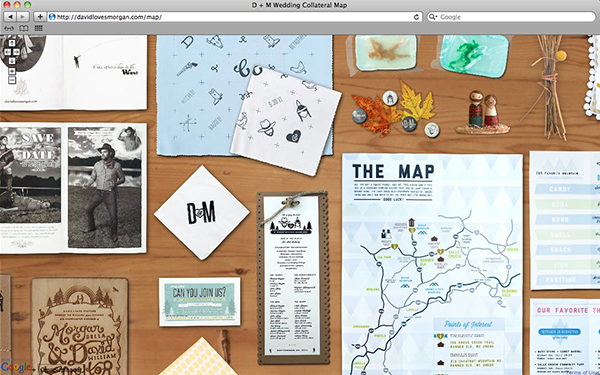 Collateral Map | David and Morgan Are Gettin' Hitched! Since David and I (with the help of my wonderfully talented Mom) designed and created so many different pieces for the wedding, we decided the best way to show it was to make one single interactive document with everything together, so you can see it all at once. My web guy (ie David) was able to code the image as a Google Maps document, so you can zoom in and out and move around within it, just like you would use a Google Map.